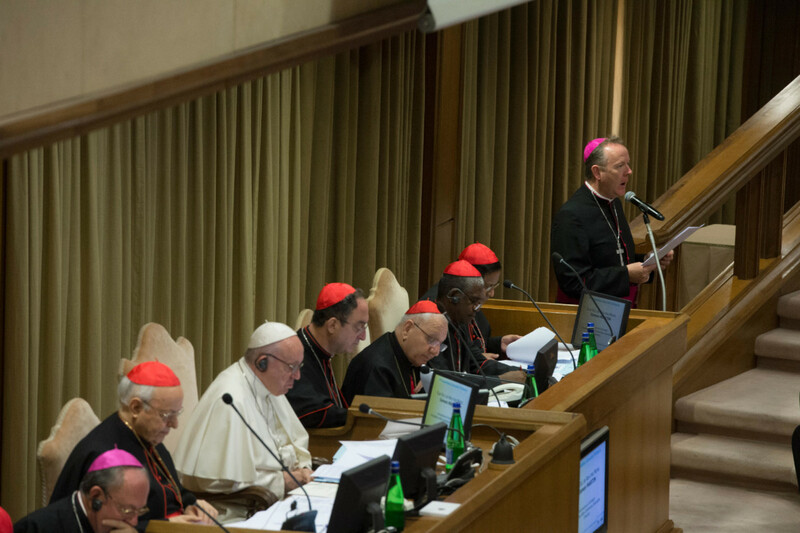 Following his appointment as Relator (reporter/secretary) of English speaking Group A, Archbishop Eamon Martin has delivered his first report to the Synod of Bishops on Young People, Faith and Vocational Discernment. Fourteen discussion groups reflected on the first part of the Instrumentum Laboris for the Synod. An Instrumentum Laboris (Latin for “working instrument”) is an official Vatican document used to guide discussion at a General Assembly of the Synod of Bishops. The Moderator of Group A is Cardinal Oswald Gracias, President of the Catholic Bishops’ Conference of India. The group is comprised of 23 Synod Fathers from eighteen countries and includes five Cardinals. The group reflecting on technology and social media which are now understood as a permanent part of young people’s lives, mental health and how vocational discernment has changed in recent times. It considered how new possibilities for the exchange of information, ideals, values and common interests online have the potential to unite people across geographical distances like never before. Archbishop Martin of Armagh and Bishop Donal McKeown of Derry are representing Ireland at the XV Ordinary General Assembly of the Synod of Bishops which is taking place in Rome from 3-28 October. It was suggested that the faith dimension, the Christological perspective could be stronger, making it clear that we are reflecting from the heart and in the light of faith on the concrete realities of young people – just as Jesus looked with love at the rich young man’s lived experience, and as he encountered the two disciples on the Road to Emmaus. Relationship is clearly the key to encounter with youth. We have offered a “modus” to Paragraph 3 which suggests deepening the process of “recognizing; Interpreting; choosing” to include, as Evangelii Gaudium puts it: “not only recognizing and discerning spirits, but also – and this is decisive – choosing movements of the spirit of good and rejecting those of the spirit of evil” (EG 51). Our Group recommends that quotations from young people in the Aula and at the Pre-Synod would help to bring any final synod document to life, as well as providing examples of thriving “peer to peer” youth movements in various parts of the world. Since we found paragraphs 52-53 to be somewhat muddled, we have offered a modus reshaping these paragraphs to reflect the importance of the human person and the human body. We noted that a proclamation of chastity, as achievable and good for our young people, is missing from the document. Our Group believes that the Church is called to respond to the desire of many young people for stable reference points, moorings or stepping stones to help them navigate their way through the often contradictory messages being hurled at them from every direction. From the riches of her teaching, including from her “treasure trove” of social doctrine, the Church can offer them reasons for living and hoping. She does this best with young people by avoiding a moralistic or polemical approach – as if we had all the “ready- made” answers – but instead accompanying young people in a climate of joy and adventure of discovery. We were inspired by Briana, the young woman from America who spoke to us in the Aula, to reflect on our own experiences of being young – for some of us that was a little longer ago than others! For many of us the joyful witness of respected and trusted priests in our youth had helped to inspire our vocation. However, the context for vocational discernment has changed utterly. Our Group suggests that the issue of child sexual abuse in the Church cannot be skimmed over tangentially in a few short sentences. The shattered trust, the trauma and lifelong suffering of survivors; the catastrophic failures in case management; the continued silence and denial by some of these awful crimes and sins – these issues cry out to be named openly by the Synod. We feel that as well as reassuring young people and their families that our safeguarding processes and norms are now robust and stringent, this Synod also provides an opportunity for us to prepare for February 2019 by speaking from our hearts about how we, as Synod Fathers feel about this shocking betrayal of our youth and of all the faithful. We should not be afraid to do so. After all, Holiness and fragility are linked. Our young people combine tremendous energy with great fragility. They are tossed around by the cruel storms of life. Too many of them suffer from mental health problems and take their own lives. They need to know that someone is there for them. We, as Christian communities can offer them space to find meaning and purpose; we can whisper to their fragility: God loves you no matter who else lets you down. Put your trust in God. Perhaps the storms we are enduring in the Church can help us walk more humbly with our young people, to listen to them with understanding and with empathy. At the pre synod, young people said they wanted a Church that “witnesses to authenticity on the path to holiness, which includes acknowledging mistakes and asking for forgiveness. Young people expect leaders of the Church – ordained, religious and lay – to be the strongest example of this” (See Pre synod summary no 7 p. 2).